"The system is completely reliable and efficient. We have been extremely impressed by the level of skill and support and we would strongly recommend them to anyone as a project partner." Glowing praise for Koneksis Elektronic Kontrol, after successfully installing 76 IMS2 soft starters in a major factory expansion for one of Turkey's leading timber processing firms, Kastamonu Entegre. 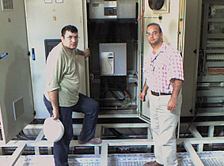 Koneksis is a long-standing AuCom representative in Turkey, and since 2002 has built a strong following of customers devoted to AuCom starters. Kastamonu Entegre already used AuCom soft starters in its particle board manufacturing plant, and was keen to continue with the successful formula when the plant needed expansion. Koneksis played a key role in the project, designing a complete solution to meet the factory's specific requirements. Koneksis's close attention to details and thorough pre-engineering ensured the entire project ran smoothly and the expanded facility opened on time with no transition difficulties. The plant uses a wide range of machinery, from mills and conveyors to pumps and fans. With motor sizes ranging from 22 kW to 400 kW, Koneksis recommended standardising on IMS2 soft starters. These advanced starters offer benefits to all areas of operation. Torque control reduces the level of vibration from fans while starting. Soft starting the conveyors reduces product damage during the manufacturing process. Soft starters significantly reduce the mechanical stress on the large mills, extending their operating lifetime.